Track lighting and rail lights can provide both ambient and focused lighting in your home or office. 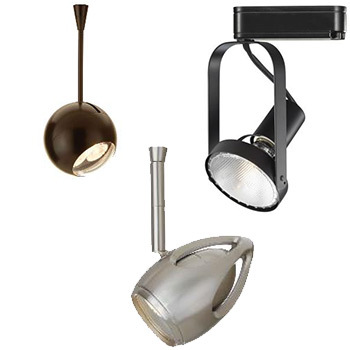 Track lighting has changed dramatically in recent years, with the addition of modern styles, halogen bulbs, and a wide variety of finishes. These new systems provide a softer light that can help reduce eye strain. Rail lights can be used to add drama and flair to a room. When used properly, rail and track lighting can accent particular features of your home, such as architectural details or artwork. Focal points such as these should have three times as much light on them as the surrounding ambient light. The expert lighting consultants at each of our three Hortons Home Lighting Chicagoland locations can help you configure the rail lighting in your home or office to create any desired effect. Many existing tracks can be used with new head pendants to match your new decorating plan. Halogen bulbs are very hot when lit, so keep them well away from curtains and any flammable materials. The universal nature of track and rail lighting allows you to put light into areas where there is not a readily available source of electricity.